Ahead of South Bend’s May 3rd mayoral primary, the Bike Michiana Coalition presented an online questionnaire to all South Bend mayoral candidates. The questionnaire was designed to gauge how their administration would approach cycling issues. The questionnaire was not completed by any of the Republican candidates, but responses from Democratic candidates Mike Hamann, Ryan Dvorak, Pete Buttigieg and Barrett Berry are listed below. The first six questions were closed-ended for ease of completion by the candidates, but the last three were open-ended to give the candidates room to elaborate on their views regarding Michiana cycling. The responses are presented in the order in which they were received. The BMC also attempted to contact the candidates for the Mishawaka mayoral race (Republican incumbent David Wood and Democratic challenger Craig Fry), but we have not yet received a response from either. Bike to Work Week is almost here: Monday, May 16th to Friday, May 20th. The official website is packed with information, and team registration is up and running. Check it out, and get ready to ride! Race Play Michiana (RPM) is a new publication in the Michiana area designed to provide “News for Sports & Fitness Enthusiasts,” and the April-May issue is now available! Print copies can be obtained from many local business, but you can also download the latest issue HERE (4.6 MB PDF) or from the raceplaymichiana.com website. I think anything to make biking and walking more better, is more better. Third grade students are taught bicycle safety. 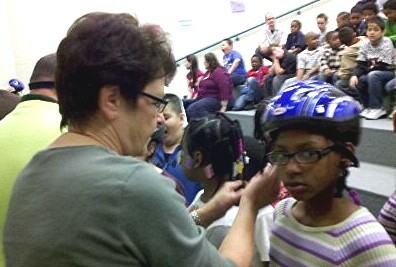 Safety classes are given to all Mishawaka 3rd grade students, and a growing number of South Bend students. As bicycles are used more and more for practical transportation, these safety classes are becoming more important each year. On the First Friday of every month – throughout the year – businesses, artists, and entertainers throw a party in downtown Goshen. On May 6, Goshen’s First Fridays event will be all about bikes with several special events. Organizers encourage event-goers to “bike to First Fridays”. The first annual I ♥ Goshen Bicycle Criterium: There will be three races for riders of various skill levels. Bicycle Safety & Info booth: Learn helpful hints about bicycle safety: from how to properly fit a helmet to pumping up tires. Free bicycle registration available. They will also have information on the endless bicycle trails in Elkhart County. Bike Decorating Contest: Participants will, deck out their bikes, Pedal, and Participate! A Family Bicycle Parade will follow the decorating contest. Girl Scouts Pedal Car Derby: Human powered and eco-friendly transportation for the little tykes. On May 6, the emphasis is on bicycling because May is National Bike Month, and May 16-20 is National Bike to Work Week. Mayor Luecke and the City of South Bend, Northern Indiana’s only Bicycle Friendly Community, invite you to attend at 2:00 PM, Thursday, April 28. It will be held at the Jon Hunt Plaza (in front of the Morris Performing Arts Center) in South Bend. In case of inclement weather, the ceremony will be held in the Morris lobby. Chris Dressel, South Bend Bicycle Coordinator, contributed to this post.